Key Facts About Influenza - Safecare Biotech (Hangzhou) Co., Ltd. Influenza (flu) is a respiratory infection in mammals and birds. It is caused by an RNA virus in the family Orthomyxoviridae. In more serious cases, influenza causes pneumonia, which can be fatal, particularly for the young and the elderly. Although it is often confused with other influenza-like illnesses, especially the common cold, influenza is a more severe disease than the common cold and is caused by a different type of virus. Influenza may produce nausea and vomiting, particularly in children. Three influenza pandemics occurred in the 20th century and killed tens of millions of people, with each of these pandemics being caused by the appearance of a new strain of the virus in humans. Often, these new strains appear when an existing flu virus spreads to humans from other animal species, or when an existing human strain picks up new genes from a virus that usually infects birds or pigs. An avian strain named H5N1 raised the concern of a new influenza pandemic, after it emerged in Asia in the 1990s, but it has not evolved to a form that spreads easily between people. In April 2009 a novel flu strain evolved that combined genes from human, pig, and bird flu, initially dubbed "swine flu" and also known as influenza A/H1N1, emerged in Mexico, the United States, and several other nations. The incubation period of the flu can range from 1 to 4 days. The onset of flu symptoms can be mild or severe. The typical influenza symptoms in adults may include abrupt onset of chills, headache, high fever, fatigue, dry cough, sore throat, rhinorrhea, and generalized aches and pains, especially in the back and legs.5-7Gastrointestinal symptoms, such as nausea, vomiting, and diarrhea also may occur. Influenza virus is transmitted via aerosols and infects cells of the respiratory tract. The time from infection until occurrence of symptoms (incubation period) is usually 1-3 days. Adults "shed" influenza virus for approximately 7 days following infection during which time they can spread the infection and thus considered contagious. Children and individuals with a compromised immune system may be contagious for up to 2 weeks. 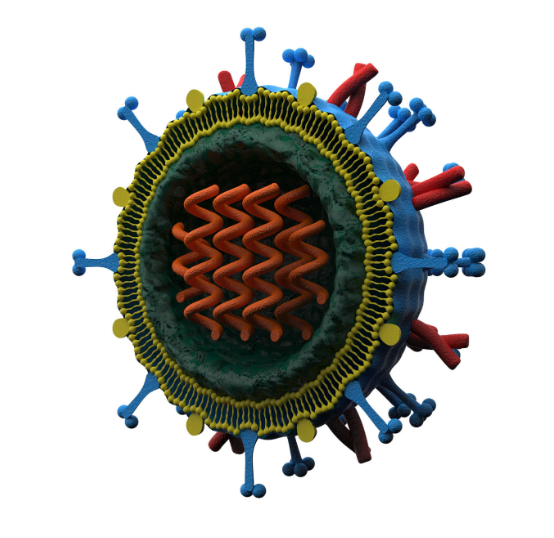 Inﬂuenza virus belongs to the family Orthomyxoviridae, which is a common contagious pathogen that causes acute respiratory tract illness in humans. Inﬂuenza virus can be classiﬁed into three types (A, B and C) based on matrix and nucleoproteins, of which Type A and B virus are prominent among the causes of severe respiratory illness. Influenza A virus (IAV) causes influenza symptom in birds and mammals, and belongs to the family of Orthomyxoviridae. There are several subtypes of influenza A virus. All subtypes are labeled according to an H number (for the type of hemagglutinin) and an N number (for the type of neuraminidase). There are 18 different known H antigens (H1 to H18) and 11 different known N antigens (N1 to N11). H17 was isolated from fruit bats in 2012. H18N11 was discovered in a Peruvian bat in 2013. All strains of influenza A virus have been isolated from wild birds, and some isolates of them cause severe disease both in domestic poultry and, rarely, in humans. Occasionally, viruses are transmitted from wild aquatic birds to domestic poultry, and this may cause an outbreak or give rise to human influenza pandemics. Influenza A virus possesses negative-sense, single-stranded, non-circle RNAs. The genome of it consists of eight independent fragments of which combines with ribonucleoprotein and form a RNA-protein complex. Each fragment contains a relatively conserved non-coding sequence and one open reading frame (ORF). The 13 nucleotides of the 5 'end of the gene were highly conserved and had the following sequence: 3'-GGAACAAAGAUGAppp-5', and also12 highly conserved nucleotides at the 3 'end: 3'-HO · UCGUCUuuCGUCC-5. The genome of influenza virus A contains 10 gene segments which separately encodes 10 proteins: PB1, PB2, PA, HA, 5-NP, NA, M and NS protein. Gene fragments 1 to 6 encode the influenza virus structural protein, and fragment 7 encodes the matrix protein. Fragment 8 encodes a nonstructural protein. Structural proteins are glycosylated and non-glycosylated points. Glycosylated structural proteins include HA and NA, the rest are non-glycosylated structural proteins. The glycosylation sites of HA and cleavage sites of mutations, may lead to a fundamental change in viral virulence. Influenza B virus (IBV) is only know to infect human beings which belongs to the family of Orthomyxovirus, and like with influenza A virus, IBV can cause human respiratory infections. This limited host and range is apparently responsible for the lack of Influenza virus B-caused influenza pandemics in contrast with those caused by the morphologically similar Influenza virus A as both mutate by both antigenic drift and reassortment. Currently there are two co-circulating lineages of the Influenza B virus based on the antigenic properties of the surface glycoprotein hemagglutinin. The lineages are termed B/Yamagata/16/88-like and B/Victoria/2/87-like viruses. The quadrivalent influenza vaccine licensed by the CDC is currently designed to protect against both co-circulating lineages and has been shown to have greater effectiveness in prevention of influenza caused by influenza B virus than the previous trivalent vaccine. Influenza B virus possesses negative-sense, single-stranded, non-circle RNAs. The genome of it consists of eight independent fragments of which combines with ribonucleoprotein and form a RNA-protein complex. Each fragment contains a relatively conserved non-coding sequence and one open reading frame (ORF). The 13 nucleotides of the 5 'end of the gene were highly conserved and had the following sequence: 3'-GGAACAAAGAUGAppp-5', and also12 highly conserved nucleotides at the 3 'end: 3'-HO · UCGUCUuuCGUCC-5. The genome of influenza virus B contains 10 gene segments which separately encodes 10 proteins: PB1, PB2, PA, HA, 5-NP, NA, M and NS protein. Gene fragments 1 to 6 encode the influenza virus structural protein, and fragment 7 encodes the matrix protein. Fragment 8 encodes a nonstructural protein. Structural proteins are glycosylated and non-glycosylated points. Glycosylated structural proteins include HA and NA, the rest are non-glycosylated structural proteins. The glycosylation sites of HA and cleavage sites of mutations, may lead to a fundamental change in viral virulence. Influenza C virus, which infects humans, dogs and pigs, sometimes causing both severe illness and local epidemics. However, influenza C is less common than the other types and usually only causes mild disease in children. Influenza C viruses are somewhat different. The enveloped virions have hexagonal structures on the surface and form long (500 microns) cordlike structures as they bud from the cell. Like the influenza A and B viruses, the core of influenza C viruses consists of a ribonucleoprotein made up of viral RNA and four proteins. The M1 protein lies just below the membrane, as in influenza A and B virions. A minor viral envelope protein is CM2, which functions as an ion channel. 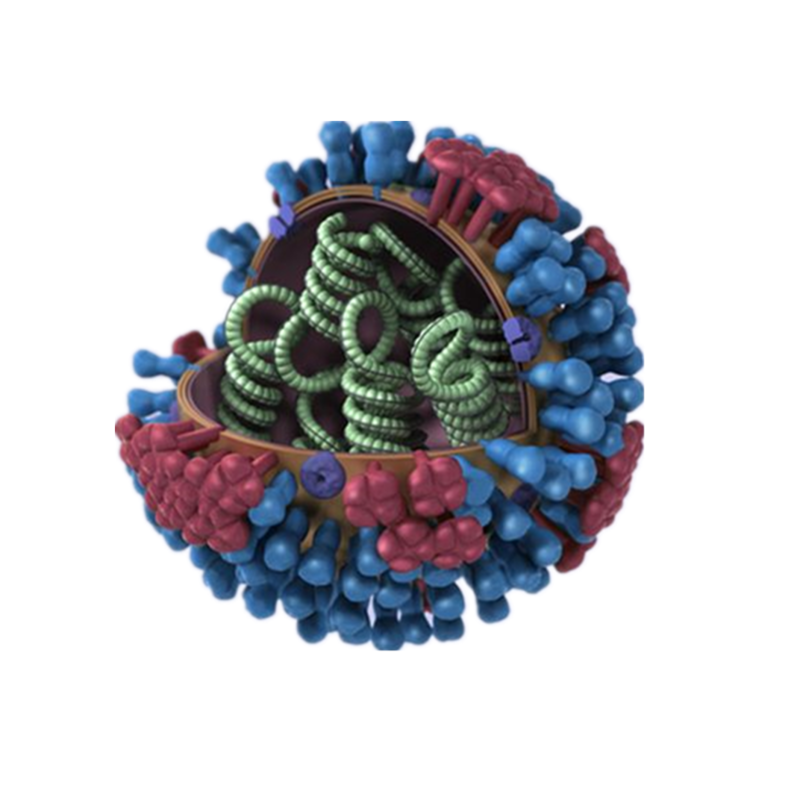 The major influenza C virus envelope glycoprotein is called HEF (hemagglutinin-esterase-fusion) because it has the functions of both the HA and the NA. Therefore the influenza virion contains 7 RNA segments, not 8 RNAs like influenza A and B viruses. Nearly all adults have been infected with influenza C virus, which causes mild upper respiratory tract illness. Lower respiratory tract complications are rare. There is no vaccine against influenza C virus. People with chronic heart, lung, or kidney disease, diabetes, immunosuppression, or severe forms of anemia. Residents of nursing homes or other chronic care facilities. Women who will be over 3 months pregnant during the influenza season. Children and teens receiving long-term aspirin therapy. These individuals may be at risk for developing Reye's Syndrome following influenza infection. People who live or work with high-risk patients. The vaccine is contraindicated in individuals with a prior allergic reaction to the vaccine and in individuals allergic to eggs. Recently, a non-egg cell-based vaccine was FDA-approved (Flucelvax). Individuals with an acute febrile illness should wait until their symptoms subside before receiving the vaccine. Clinicians are not able to accurately diagnose influenza based on signs and symptoms alone. There are many other viruses that infect the respiratory tract and there is a large overlap of symptoms among these infections. Diagnostic tests performed on specimens taken from the respiratory tract provide a useful aid to the diagnosis of influenza. There are a number of methods available to laboratories to detect influenza virus in respiratory specimens from patients. Traditionally, laboratories used viral culture to detect influenza virus and improvements in virus culture techniques allowed for results within 48-72 hours. The direct fluorescent antibody (DFA) method allows detection of virus within 2-3 hours, but is labor intensive and requires considerable experience. Molecular methods such as reverse transcription polymerase chain reaction (RT-PCR)-based tests are the most accurate methods to detect influenza virus, but are expensive and can only be done in laboratories that can afford expensive equipment and employ highly trained technologists. Rapid influenza diagnostic test (RIDTs), such as lateral flow tests, can be performed at the site of patient care such as the physicians’ office or emergency department. These tests offer the possibility of identifying an infected patient early in the course of the disease and during the patient’s visit to the health care facility. Early diagnosis at the point-of-care can have a positive impact on the efficacy of therapy and other clinical management decisions. Several anti-viral drugs are available which can decrease the severity and duration of flu symptoms if administered within 48 hours of the onset of symptoms. Rapid and accurate diagnosis of influenza at the point of care maximizes the benefit of these anti-viral medications. Supportive therapy that addresses the symptoms is an important aspect of treatment. Hospitalization may be required in serious cases and for high-risk patients especially if complications occur.